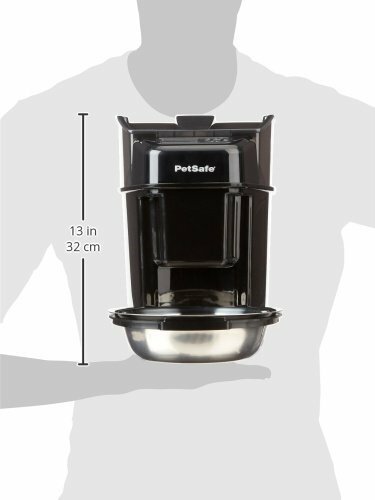 If you’re looking for a fantastic automatic cat feeder that offers up to 12 meals per day, then the Petsafe Healthy Pet Simply Feed may be for you. 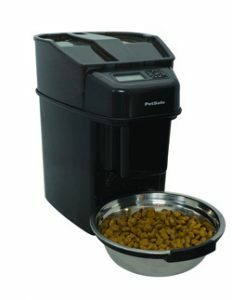 Sourcing numerous customer reviews, we’ve found this device to be the top rated automatic cat feeder on the market. After testing, we’re inclined to agree. The Petsafe Healthy Pet Simply Feed allows full customization. From how many times a day your cats are fed to the portions and more – this is a set it and forget it type of feeder. The hopper can hold up to 24 cups of dry cat food at a time and offers transparency to ensure you can see how much food is left. I’m not sure about you, but my cat Fozzie typically eats around 2-3 cups of food a day. She prefers to eat 3-5 times throughout the day. So I schedule this unit to dispense half a cup of food five different times each day. It’s the perfect schedule, and she loves it. 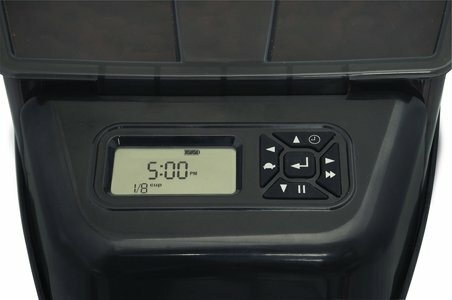 Plus, I only have to reload the hopper once every 9-10 days. Talk about little maintenance! There are a variety of programming options on the Petsafe Healthy Pet Simply Feed. From portion control to feed schedule – everything is programmable. You can use the immediate feed, slow feed mode, and pause feed mode however you see fit. Any way you want to feed your cats can be programmed with this device. Due to the unique design of this programmable feeder, your cats won’t be able to steal any food from this feeder. You won’t have to worry about pesky paws reaching into the hopper for food. Petsafe keeps your cats away from the food until it’s time to eat. This feeder comes almost fully configured. As such, the setup is incredibly easy. You won’t be sitting around trying to piece this model together for awhile. Once it’s out of the box, it’s time for your furry friends to start eating. 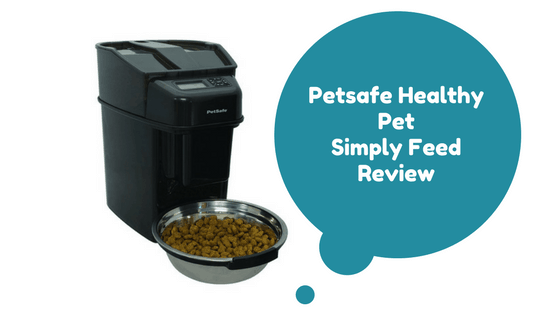 If you’re looking for an automatic cat food dispenser with all the programmable features, bells, and whistles – then the Petsafe Healthy Pet Simply Feed might be just what the vet ordered. 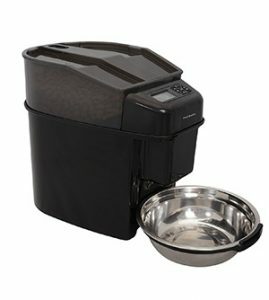 This model offers everything a cat owner could need to keep their furry friends well fed and happy. Overall, we highly recommend this model. Not the right feeder for you? Check out our guide to the best automatic cat feeders that we reviewed.